It’s becoming more and more common to raise Guinea fowl with chickens. 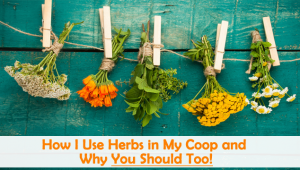 So we have put together some useful information for you regarding these birds and what sort of room-mates they make for your chickens. It’s important to know that Guinea fowl and chickens are vastly different in their lifestyle and habits. This may sound like stating the obvious but it does need to be understood that they are very different birds indeed. This article will help you understand the dynamics of these two very different birds. It is possible to keep the two together but it will take some adjustments on your behalf. If you expect that the guineas will just ‘fit in’, you are in for a big surprise. 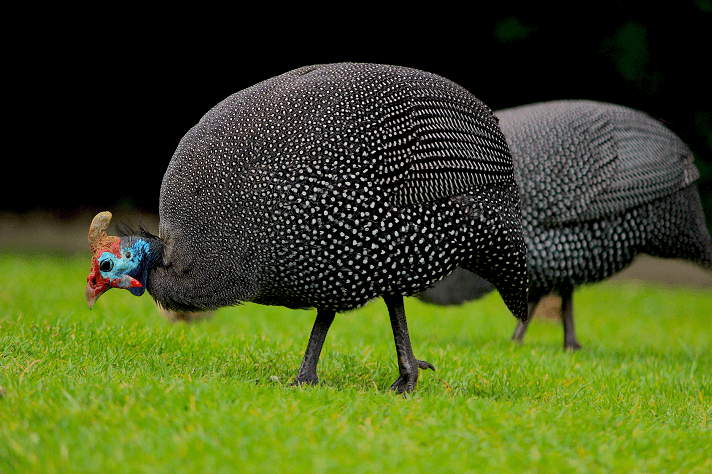 The Guinea fowl still runs wild in its native land of Africa where it is quite prolific. The Guinea fowl has resisted all attempts at domestication. The Guinea fowl has not been ‘improved’ much by mankind to any great degree, this makes them incredibly hardy and relatively disease free. They do not need people to thrive – they can manage well on their own. They feed themselves very well and although a good percentage of the flock may succumb to predators or disease, they continue to breed in sufficient numbers to maintain flock integrity. 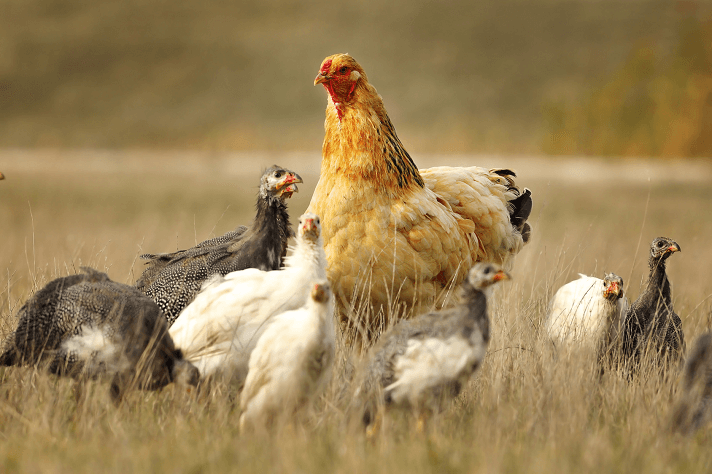 The chicken that we all know and love is to a great extent a very domesticated creature, even the flighty breeds that would prefer no humans around. The process of domestication has been centuries in the making – a slow progression to the point of ‘farm bird’ and pet. We have changed the chicken in many ways and the chicken has come to rely on humans to a great extent. After all, we feed them, house them and care for them. It is a somewhat symbiotic relationship. If you intend to keep the guinea fowl from wandering off it is best to raise them in a house that will be their ‘forever’ house. If you move them from one place to another you run a very big risk of having them wander off never to return. If you raise the keets (babies) with chicks you will stand a better chance of them not wandering off as they will bond with the chicks. When they are ready to be let out into the yard, there is a whole process to follow if you expect them to come home. Most agree that you let out only one keet at first. It will wander around a bit but won’t go far because of the flock mentality. It will learn its’ way around the coop and surrounding area but will not stray far from its flock-mates. The next day you let out two and so on. The reasoning being that they have now imprinted ‘home’ on the coop. At roosting time, they dislike entering dark places so a small night light in the coop will entice them in – along with some ration and cracked grains. Don’t be surprised if your guineas start roosting in trees or on top of the barn, it’s what they do frequently. They can fly very well for about 500 feet, so high places are well within reach. Turkey starter (21-23%) for the first 4 weeks and then 18% feed should be given as needed, this is assuming you are incubating eggs or have managed to corral some very small keets. Medicated feed should never be given to Guineas since it is highly toxic to them. Maintenance feed can be regular chicken ration. 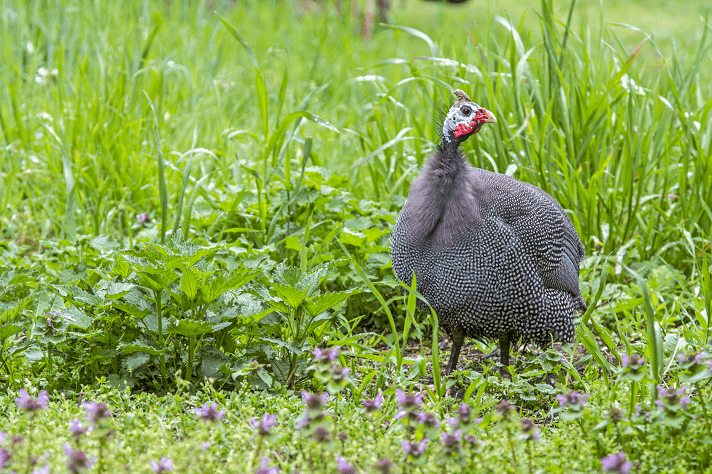 However guinea fowl are incredibly self-sufficient when it comes to food, gathering much of what they need while ranging, this makes them very thrifty fowl to keep. They will rid your property of ticks, small snakes, small rodents and insects in short order. They are known for eradicating ticks very effectively. They also eat weeds, seeds, and other undesirable things. Male Guineas can be very assertive, especially if you have roosters in your flock. The Guinea males will run off the roosters in short order. They may harass him, deprive him of food and fight constantly. It is not a harmonious relationship. They can also be pushy with smaller birds too, although some of this behavior is modified if they are raised with chicks. Although Guineas are monogamous, there is the occasional mating of Guinea and chicken, which can result in sterile offspring. In a small farm/back yard set-up many folks agree that a ratio of one male to five female Guineas is acceptable. When it comes to intelligence the guinea fowl was last in the line and the bucket was almost empty. Many owners have said that it is a wonder the birds have survived at all given their intelligence levels. They will roost in places where they get picked off by owls or raccoons, nest in dangerous spots and do other suicidal things too like crossing roads when cars are coming; they are definitely not bright. In Australia they are known as Goonie birds – very appropriate we think! We tend to think of chickens as a flock, which they are. They range out together and spend time with their companions, but they also can do things independently. 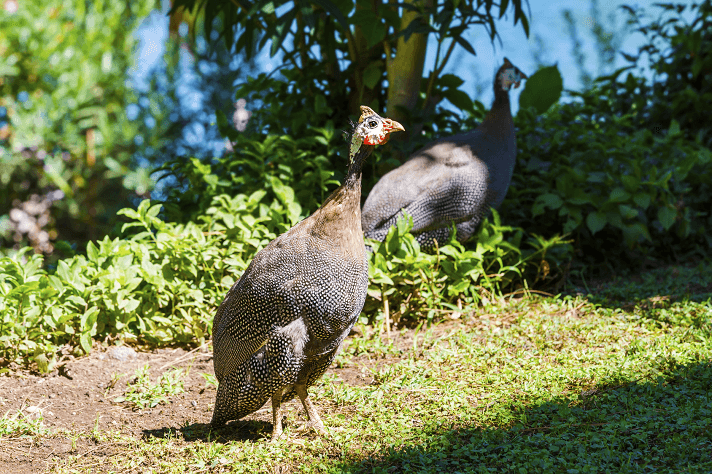 Guinea hens can function well as both an independent unit or as a flock – this behavior is natural to them in the wild. The guinea takes ‘flocking’ to a whole new dimension – where one goes, they all go (a bit like sheep)! It’s like watching a small, gray wave cross the lawn. Apparently if one gets separated from the flock it will make a lot of noise until the flock comes to find it! Guineas can be difficult to confine. They fly well so fencing really doesn’t stop them, you would likely have to build a total enclosure – but then guineas don’t thrive if confined. Their natural behavior is to wander and roam at will and they do. As we already mentioned, if raised with chicks they are more likely to return to base, but this is not a given. Enticements such as feed and water in their shelter area will encourage them to come home, but doesn’t always work. 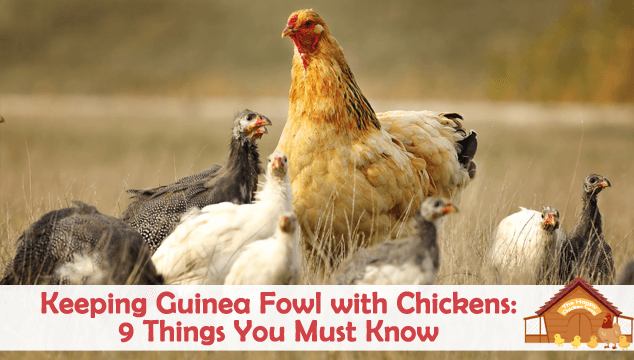 All guinea keepers will tell you – guineas are LOUD! This can be annoying for your neighbors, especially if they are close; in fact if you live within city or town limits they are likely banned. Kindly folks will tell you they are great ‘watchdogs’. Other, perhaps more realistic folks, will tell you they will alarm for a plane flying over, the neighbor’s dog barking or because a leaf fluttered by. 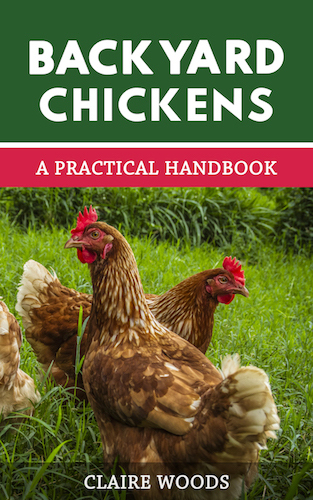 Initially this will startle your chickens, it might even put them off lay for a short time, but they should adjust eventually. Guineas tend to lay eggs communally – where one lays, they all lay. 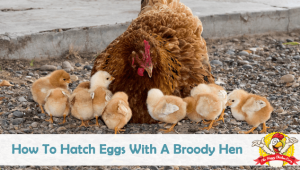 A clutch can be as many as forty eggs! Mothers may brood communally, each taking turns in sitting on the eggs. The mother will sit for 28 days assuming she didn’t nest beside a raccoon den or other such hazardous spot. She will be guarded by her mate who will keep an eye open for danger during the daytime, at night she is on her own. When the keets hatch she will march them back to the flock – over hill, down dale, through water…it’s a small miracle that any survive since the keets are susceptible to cold and damp. In fact, when raised in the wild a large percentage of keets succumb to Mother Nature. Once back with the flock she is just as likely to forget she now has babies and will run with the flock. If the keets cannot keep up with the flock they will be picked off by any predators – I suppose this is what makes them so very hardy. Many folks have kept guineas and hens in a relatively peaceful co-existence, other folks have given up on the Guineas and either sold them off or the birds simply wandered away. Remember, chickens will naturally go to roost at night whereas Guineas are very independent; they will not go to roost in the coop because you expect them too. You may succeed to some extent if you are prepared to put in a great deal of time and effort to caring and working with them. Guineas are known to be relatively long-lived – they can live 10-15 years. We found that rather surprising given that they are not the smartest bird out there. Many owners have said they would not be without these odd creatures as they are not only great for the garden, but they are also quite tasty as table-fare and have very rich eggs too. I have 5 Hens and 4 Guinea’s. They get on together famously. I have the reverse, my Guinea”s will not wander, where the Hens go the Guinea’s will follow. At night the G’s will roost on the Hen house. I can sit and watch them for hours, they are the funniest Bird I have ever seen. I would recommend them to anyone who has Chickens. Cheers Danny Roberts. Danny did you raise the hens and keets at the same time? We have Guineas and we love having them. We have chickens sit on the eggs and raise them, which works out wonderfully. We have found that our bantams make the best moms. I have 5 hens, 4 guineas, and 2 roosters. Right now I have 1 hen and 2 guineas sitting on about 25-30 eggs mixed in one laying box (actually a horse corner feeder). The box is about 3 feet off the ground in the barn and I’m not sure what to do. I was going to put some straw bails under the box to lessen the height for hatch time but never is the nest left alone. Any suggestions? 1 week left till the 21 day mark. I have 8 guineas, and 9 hens, 4 ducks, 1 goose, all get along just fine. I have production red chickens (hens) and two guinea fowl who are 18 weeks old now, and I think I have made a mistake by making them into pets. I let the chickens and guineas free range twice a day, at least for an hour at a time. I have two runs for them to stay in during the day and two coops for night. The guineas won’t eat bugs and won’t leave my patio unless they follow us out into the yard, to the barn, or to the field. I can pet them as easily as I do my chickens. BUT I need them to start hunting for bugs and not just sit on my patio furniture!! Are they just too young? Or have I spoiled them rotten? I have a mixed flock of Gunieas and hens that have a love/hate relationship, to say the least! Ten Guineas, eight chickens and one Rooster. Most of them were eggs together. Male guineas will chase off the little fluffers by stamping a foot a them and a hiss click noise. If the fluffers we’re just cracked out of an incubaitor, they will need a lot of attention from you, or an older female hen or Guinea to adopt them. The first spring/summer I had my flock, I made the mistake of giving them a piece of bread outside my back door. Suddenly, I had a screeching awking gaggle that crapped everywhere, living on my back porch!! WTD? WTD? I added a yard attached to their hutch that is big enough to feed my flock in during winter or yucky storms. I started tossing out a few meal worms to entice the guineas, and the chickens love them!! Anyway, everyone runs into the enclosure (we call the netted enclosure the coop) as soon as they see me or hear me rattle the worn can. It only took once, and they are usually in the coop an hour before sunset, waiting on me. We purchased 10 keets in the early summer and introduced them to an established flock of layers, a rooster, and a pair of ornery Chinese geese. Unbelievably, all get along, or I should say – tolerate one another. The sole rooster (Ameraucana) is not the least bit put out by the Guineas, nor are they by him. However one female Guinea appears to have been shunned by the rest of the Guineas so she tends to hang out in the coop with the layers (Ameraucanas and Barnevelders). However she does return to the Guinea shelter at night, which is separate from the coop. Recently, the Guineas discovered a porcupine traversing the property so they began harassing it! Had to separate them from it so it could escape. On another occasion, 8 wild turkeys showed up and the Guineas were so taken with them that when the turkeys departed, the Guineas accompanied them! Had to retrieve them after following their calls through a wooded area to track them down and turn them around. Needless to say, it has been an interesting adventure…so far! We have 4 birds, 2 female and 2 male. A few weeks ago I heard them sounding off, and looked out the window. One of the males was standing up nose to nose to a very bewildered coyote at our mailbox!! He ended up chasing that coyote back where it came from! These birds are simply amazing…very loud, but would not want to be without them. And yes, they do not do well raising keets.? We raised 4 guineas with four chickens. Just lately, this Feb 2019, I notice a male guinea roughing my chickens, pecking at them and rushing them. Is this normal? Should I separate them? The were raised together and all go into the hen pen at night. But I am worried about my chickens being bullied. Its territorial pecking order, give it a little more time, but keep a close eye. They should find a balance in no time. I forgot to mention he might just be trying to get her to mate with him. Guineas are monogomous-typically one male has a harem of up to five fems that are His. Lol Male guineas don’t sneak next door to have flings with pretty hens, like roosters do. Yep, your chickens are being bullied. With mine, it progressed to chasing and pulling feathers out to holding them down and pulling multiple feathers out! I had sprayed my hens to keep guineas away, but the only thing that worked was booting my guineas out of the hutch and coop. They prefer to be outside and were only frustrated because it had been so cold. I fed them, but… Now, they go in n out of the coop and hutch, will come when I call, no bully’s, and they roost on top of the hutch and coop netting. Sometimes, when you’re a wild thing, frustration at being cooped up is let out on rest of flock. In my experience, Guineas don’t participate in the pecking order of chickens. They have their own rules and while they can walk n talk chicken, they are still guineas! !